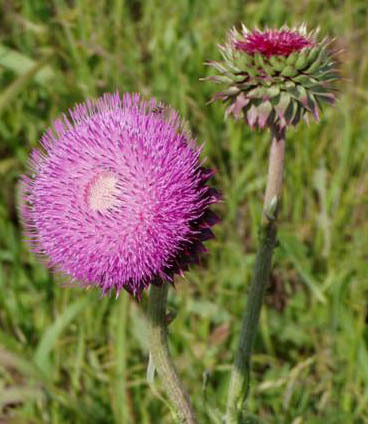 This pretty purple flower is illegal in Kansas grasslands...well, at least it is if you are a rancher! The musk thistle is a noxious weed in Kansas and you must control it, or eradicate it if possible. If you do not control this weed, it will take over a pasture in no time! Each flower produces millions of seeds and one plant left to go to seed will allow a corner of a pasture to grow thistles as far as the eye can see! 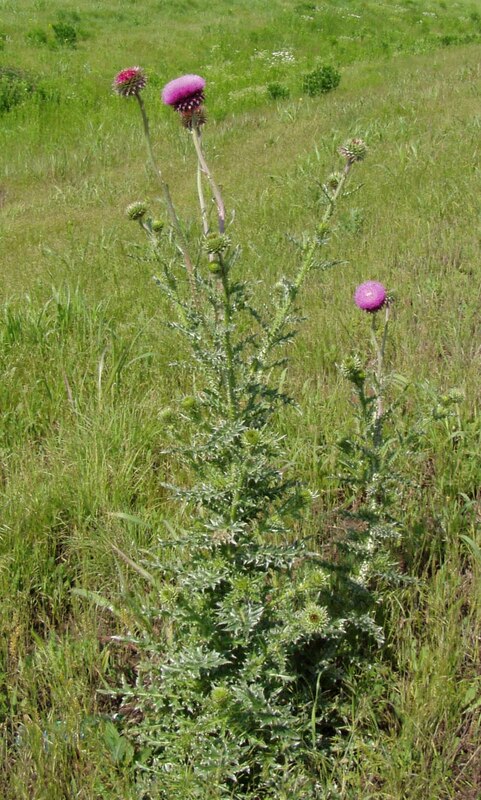 My husband's father was a big opponent of the musk thistle and not only did he work tirelessly to rid his pastures of the plant, but also worked to have it declared a noxious weed that must be managed. Now we spend a lot of days every spring driving through the 3,000 acres that we own or manage hunting for these thistles. If you are diligent in your hunt, you can merely use a hoe or shovel and dig them out of the ground. If the flowers have turned purple, you will have to pull them off and burn them to keep the seeds from spreading. These thistles have a very long taproot and are difficult to kill. Even when you think your pasture is clean and has no thistles, you must check for them every spring as the seed may lie dormant for years and spring up one year to invade your grass. The hunt for the thistles has been an all-consuming job for my boys this spring. We have had an above average amount of rain and with the fields wet, we are not able to mow hay. So the boys have loaded up the three ATVs and scoured the pastures for thistles! They each have a hoe, a bag for the purple heads, a pair of thick leather gloves and a sprayer with chemical to kill the more determined thistle patches. No animal can eat any part of the thistle, but there are a few insects who will eat the seed pods in the head. But it takes a lot of these hungry beneficial insects to eat their way through the thistles in the Flint Hills. So we wage our own war on this enemy. So far, we are winning, although this wet year seems to have brought out a larger than normal amount of thistles. My boys are determined and they are proud to report as they finish each pasture. They like to say how many thistles they found and whether it is more or less than last year. At the same time that they are looking for thistles, they are looking at the cattle to check for illness and injury. In one of our pastures they found a bull who had been injured. This is every ranchers fear as an injured bull is not able to breed cows, and if the cows don't get bred within a certain time frame, there will be no calves -- and that means no income for that year! So when they found him injured, they called me and we walked him to the nearby pens to load him onto the trailer to take him to the veterinarian for treatment. At the same time, we had to take another bull to the pasture to take care of the cows. Every day there could be cows in heat, and if they are not bred, there will be no income. Luckily, I raise and sell Angus bulls so I had another good bull available to use. If a rancher does not have another bull, it will cost a lot of money to replace an injured bull. This year, I sold my bulls for an average of $3,000 each. So if you buy one and he gets injured, not only are you out the money for him, but you have to spend about the same amount to buy another one! Ranching is not a cheap or easy business. Last week, as the boys returned from early morning weight lifting at the school, they were walking toward the house when they heard kittens crying. We have a litter of kittens living in the shed, but the noise wasn't from that direction. They tracked it down and found that all five kittens from the litter had fallen down a drain pipe at the corner of the house intended to drain the gutters into the ground and away from the house. It is a four-inch PVC pipe that goes 10 feet into the ground! I have no idea how those kittens fell in, but they must have been there for a couple of days as my cowdog had been hanging around that spot for awhile whining. She obviously had been trying to catch our attention, but we hadn't understood. To make an extremely long story short, my three teenage boys--who herd cattle, drive ATVs, and do daily physical labor on the ranch--spent a couple of hours that day pulling five dehydrated, slime-covered, near-dead kittens from that drain pipe! Amazingly, all five lived after a warm bath and lots of water and food. They are all doing well and the boys are pretty proud of their rescue! I'm very proud of them, too! It just goes to show that farm kids are animal lovers all around! Sounds like your life is similar to mine in a few ways. My husband declares war on the thistles every year. Last fall, we had a bull who broke his leg fighting with another bull. We had only had him 1 year, and it was hard to turn him into hamburger. Kudos to the boys for rescuing the kittens!